A sketchbook including a selection of 14 bozzetti (recto and verso of the sheets), of which 6 on sepia paper, 7 on white paper, and 1 on fine tracing paper. 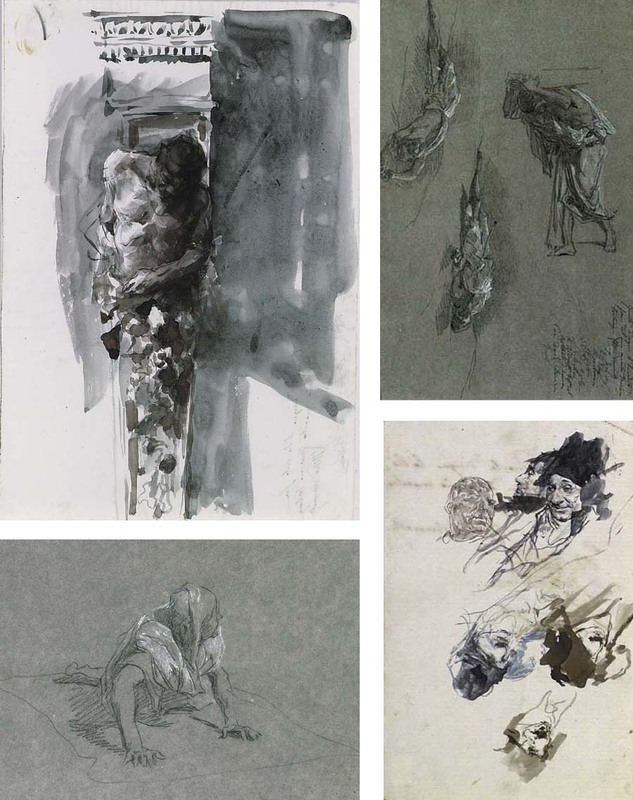 The first, the seventh and the eleventh drawings in the sketchbook inscribed 'Questo disegno l'ho veduto fare dal mio maestro Mariano Fortuny Attilio Simonetti P. Joris C. Bivea M. Manovani M. Gioia D. Dertigny L. Costantini A. Allegretti Prf.re nel R. Istituto Roma Cav. Mario Querci'. A very interesting summation of Fortuny's thematic and stylistic concerns in the early 1860s, this sketchbook is a rare collection of the most diverse sheets - from the finished studies for the famous Batalla de Tetuàn (1863, Private Collection) to the delicate architectural drawings, genre sketches and Orientalist landscapes, where the subject becomes a pretext for small technical tours de force and unique investigations in the nature of chiaroscuro. Bearing the signature of Fortuny's students and colleagues - led by his close friend and biographer, the artist Attilio Simonetti (1843-1925) - the precious book pays homage to Fortuny's crucial role within the Roman artistic community in the mid-19th century, whilst celebrating the richness and complexity of the master's creative endeavours. Dr Lopez confirmed the authenticity of this sketchbook, whilst pointing out that it was executed between 1860-1867.